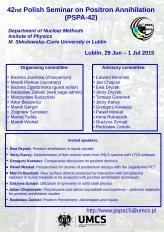 It is our pleasure to invite you to participate in the 42nd Polish Seminar on Positron Annihilation. The purpose of PSPA-15 is to gather people interested in research related to the annihilation of positrons and positronium in order to exchange ideas concerning new results and experimental or theoretical methods in this field. The conference will include invited talks along with contributed oral and poster presentations. 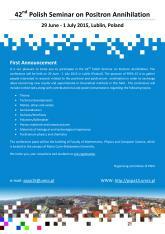 Please, see our First Announcement for list of topics and this www site for other information. 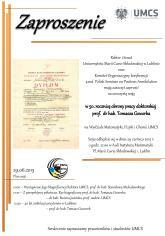 We look very much forward to seeing you in Lublin. Please have look at the posters announcing the incoming events. The conference is a meeting allowing the presentation of the latest developments and exchange ideas in the field of research related to annihilation of positrons and positronium. © 2015 Maria Curie-Skłodowska University. All rights reserved.